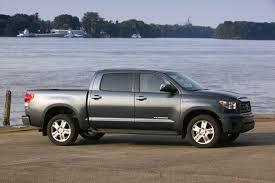 On Friday, Toyota issued a recall for 130,000 of its Tundra CrewMax cab and Double Cab trucks. According to the company, these vehicles may be equipped with a “center pillar garnish” (a plastic interior panel) that if improperly installed could prevent the deployment of a side impact airbag. Toyota says there have been no reported injuries or deaths related to the malfunction. They will, however, be sending out letters in the mail to vehicle owners, asking them to take their vehicles to the closest Toyota dealership for repairs. The recall is voluntary, but recommended, and free of charge. This recall, of course, comes just months after the widely publicized July Toyota recall. During the July recall, 2013 and 2014 Toyota Tundra trucks that had been modified by Gulf States Toyota Inc., which operates in 5 southern states, were recalled because the wheels could break off while the vehicle was in motion. For that malfunction, Toyota replaced the lug nuts of affected vehicles. With the recall of 130,000 Toyota trucks, the record-breaking recall year has risen even higher to an astonishing 46 million vehicles, well above the record of 30.8 million set in 2004. It’ll be interesting to see how much higher that number grows to before the end of the year. This entry was posted in Culture, Toyota and tagged 000, 130, Double Cab trucks, recall, toyota tundra, Tundra CrewMax. Bookmark the permalink.